From the announcement of Patti Smiths meltdown line-up this always seemed like one of the clear highlights. Jeff Beck, Flea, Tom Verlaine, John Frusciante and others joining Patti Smith for an evening of music celebrating Jimi Hendrix. 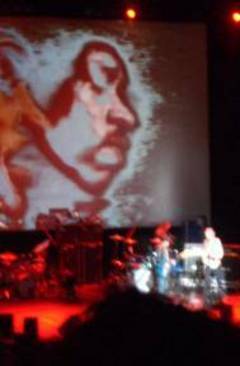 John Frusciante does Hendrix? That sounds awesome, dude! Things started to go wrong shortly after that when Frusciante announced that he was not going to be able to make it, due to recording work on the new RHCP album.
. but then Patti Smith left the stage and the next act came on. Surely the logical format for an evening like this was Patti Singing with an ever changing line up of superstar backing band?! but no, each act came on, did one or two songs and then left. There were some collaborations, like Robyn Hitchcock and Johnny Marr doing May This Be Love, but generally it was a stilted, atmosphere-free evening while people trudged on and off stage and roadies wired up new equipment.
. but essentially it was all a bit like watching a busker do a cover of Purple Haze by playing it on a washboard. The closest to getting the freak-out vibe of Hendrixs playing were Finnish duo Kimmo Pohjonen and drummer Sami Kuoppamaki, who rocked out their accordian/drumkit tracks in true freak out style. but Pattis emotional recital was undermined by the fact she was reading the lyrics, and guitar-doofus Verlaine was busy tuning up as usual.